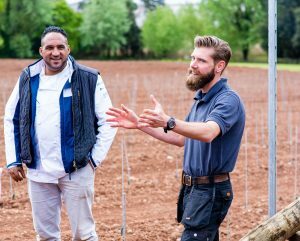 When we planted the Lympstone Manor vineyard in May, we could not have hoped for a better summer to help the 17,500 Chardonnay, Pinot Noir and Meunier vines to establish themselves. The warmth and dry weather, says James Matyear, our Vineyard Manager, have provided the perfect conditions for this first year of growth and herald well for the future prospects of growing grapes and making wine here on our sloping parkland above the Exe estuary. Find out more from James in his Vineyard Notes below. 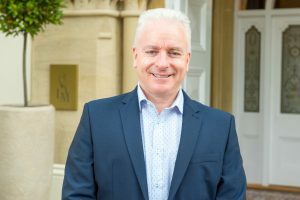 Steve Edwards, meanwhile, turns his attention to a very exciting development here at Lympstone Manor, our months of Burgundy (October) and Bordeaux (November). This is a fabulous opportunity for us to delve into our 600-bin cellar to unearth and share with you some very special wines in some cases from both great properties as well as outstanding and mature vintages. For me, great food is never complete without the perfect pairing of wine to accompany it. I will be creating special tasting menus for our showcase Burgundy (October 10) and Bordeaux (November 1) wine dinners with dishes paired with some truly special, rare and extraordinary wines. Steve Edwards explains everything in his Wine Talk feature below, together with full tasting notes for the special wines that we will be showcasing. Finally, Marko Mägi, our inspirational Head Sommelier, continues our theme of Burgundy and Bordeaux, explains why he finds each region so special and inspiring, and shares tasting notes for the wines that will be available by the glass or bottle during our months of wine in October and November. We hope to see you soon and to share a glass with you. To start the Autumn months this year we are delighted to celebrate two of the most recognised and respected of all wine regions, Burgundy and Bordeaux. We will be offering very special and highly sought after wines by the glass during October for Burgundy and November for Bordeaux. In addition, we are hosting a fabulous wine dinner each month (Wednesday October 10th for Burgundy and Thursday November 1st for Bordeaux) in which we will select a range of very special wines that are not only of outstanding quality but also fairly representative of each region and which of course match perfectly with Michael’s cuisine. Burgundy and Bordeaux could not be more different not only in terms of wine but also in their sense of place. In spite of the reputation and expense of its greatest wines, Burgundy can seem almost rustic, with its scores of small growers’ houses and caves dotted all along the evocative Route des Grands Crus. These quiet wine villages in eastern France are a striking contrast to the grand, whitewashed châteaux of Bordeaux’s Médoc, Graves and St-Emilion, all surrounded by their own perfectly manicured vineyards. Burgundy is the source of benchmark wines produced from two of the world’s most iconic grape varieties, Chardonnay and Pinot Noir. Bordeaux produces outstanding dry and lusciously sweet whites (from Sémillon, Sauvignon Blanc and Muscadelle) and reds (usually blends of Cabernet Sauvignon, Merlot, Cabernet Franc and Petit Verdot). Click the links below for my background notes about each region, as well as tasting notes for the very special wines that we will be serving at the Burgundy and Bordeaux wine dinners. 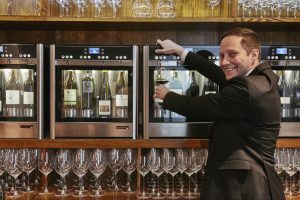 Throughout October and November, we will have on offer a selection of Burgundy and Bordeaux wines available by the glass from our Wine Emotion dispense system which keeps open bottles in perfect condition. See our Head Sommelier Marko Mägi’s tasting notes for these wines below. The summer of 2018 has so far been that of near perfect conditions. Despite the concerns and delays to planting due to heavy winter snows and a wet spring, we have benefitted from one of the longest and hottest summers for many years. The vines have established well and are now reaching the tops of the foliage wires and beyond. Concerns as to whether it would be too dry have proven not to be the case. The vines have dug deep and obtained the moisture they so vitally need, especially when so young. This year has been very much about letting the vines grow as much as they can, keeping the weeds down and monitoring for pests, disease and nutrient deficiencies. Tucking in any vines that require the support of the foliage wires is important in order to prevent damage, especially with the Meunier that tends not to support itself as well as the others. As we edge towards the end of summer, established vineyards will be planning for what should be a bumper harvest, whilst for our first year vineyard, planning now takes place for the start of 2019. Nutrition and spray programs need to be planned, and pruners booked in order to begin pruning towards the end of January next year. This has been a fantastic year for viticulture, and a promising start for our exciting new vineyard. November 1 — Bordeaux wine dinner (tasting menu created by Michael and paired with a stunning selection of wines). This evening will be hosted by Rebecca Gergely. As a sommelier, I am a true fan of so many different wine regions and grape varieties, but at least for me, there have been two wine regions which have changed my life, Burgundy and Bordeaux. I will be forever grateful that as a sommelier I am in the fortunate position where I am able to open, taste, serve and recommend wines from Burgundy and Bordeaux by iconic producers and from great vintages on almost a daily basis. I am so excited to be able to share my passion for these two great wine regions during our Lympstone Manor months of Burgundy (October) and Bordeaux (November). Here is what I love about each of these fascinating – and very different – wine regions. Burgundy is by far the most complicated wine region in the world and the difference is all in the details. Chardonnay and Pinot Noir are grapes that are perfect mirrors of terroir and Burgundy is everything about terroir. It means that every single part of vineyard, every single producer, every single vintage makes a wine that is completely different in details and these details are more magnified than in any other region in the world. Let’s put it into context. An example would be a Grand Cru vineyard in Gevrey-Chambertin called Mazis-Chambertin which is actually smaller than our own Lympstone Manor vineyard with just 9.10ha. Yet this small parcel is owned by 18 different wine producers/négociants while some growers might choose to sell their grapes (or wine) to other producer/négociants, complicating things even more. Mazis-Chambertin has two different sub-parts and soil types adding to different styles of wine, and currently the common vintages on the market are from 1997 to 2016 — so that is at least 350 wines that are very different in those all-important ‘details’! This is just one tiny example, for Mazis-Chambertin represents less than 2% of the whole Gevrey-Chambertin production. Here are a few examples of Burgundy wines that have been almost life-changing for me due to these ‘small details’ that come together to create the greatest wines. Before tasting the white Burgundies of Domaine Coche-Dury, I didn’t have a full understanding how expressive and intensely pure minerality can be in a wine. Before tasting Romanee-Conti 2006 Montrachet I couldn’t imagine that a white wine could taste so long, be so rich yet so balanced, be so ridiculously seductive. Before tasting Romanee-Conti Richebourg 2005 I couldn’t believe that a fresh style of red fruit could be so expressive on your palate that you can actually feel every possible shade of the colour red, almost as if for the first time in your life you are tasting wine in High Definition. Before tasting 1996 Henri Jayer Cros Parantoux I couldn’t fully understand complexity, earthiness, concentration and how it feels to taste wine history in a glass. Some producers, some vineyards, some vintages are more expressive in those ‘special details’ that make Burgundy such a unique and special wine. It is no surprise that demand for such wines has made Burgundy by far the most expensive wine region in the world at this moment. During our month of Burgundy, throughout October we will celebrate and showcase a range of truly great wines that we have been carefully tasting and selecting over the past year. I am sure that you will enjoy them! November allows us to turn our attention to what many consider the greatest wine region in the world, Bordeaux. For me, no other region has given me greater appreciation of the importance of vintage. When you have the opportunity to sample a bottle of mature Bordeaux, a wine from a great producer which has been aged well, you will come to understand the emotion of greatness in a wine. You can read about or listen to other people talking about this great vintage or that, but the only way to really understand it is to live through this experience yourself. With our Bordeaux dinner, our guests will have this experience as we will be showcasing great wines from the 2015, 2010, 2005 and 1996 vintages. For example, I am delighted that we are able to serve a truly great wine, the 1er cru classé (or First Growth) Château Haut-Brion 1996. For it was through tasting vintages of this wine that I came to an understanding of how wine evolves with age and the incredible longevity of great Bordeaux. I have been fortunate enough to be able to sample great vintages including 1982, 1961, 1945, 1929, 1928 and I understand now that great wine can outlive us all. As a sommelier, as a person, it humbles you. Another example: for the entire month of November, we will be serving Château Filhot Sauternes 2010 which I consider one of the greatest historic wine properties in this area famous for its amazing dessert wines. Like the best red Bordeaux, great Sauternes similarly has the most remarkable ageing potential, with the balance and components that enable it to mature and evolve for over a hundred years. Yes, that’s right, the oldest wine in good condition that I have ever sampled is Chtâteau Filhot 1890 (that’s not a typo). With such an incredible selection of wines to be able to share with you, I can say too that working with Michael to create the food menus for our special Burgundy and Bordeaux wine dinners has been the most challenging (and the most fun) we ever had in our efforts to find the perfect food-and-wine pairings. 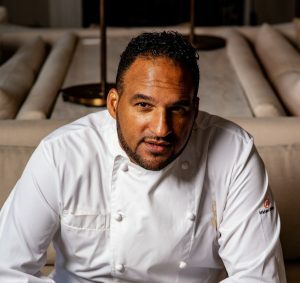 Michael has the most amazingly precise palate and the challenge has been to create dishes in perfect harmony with wines so that each enhances the other with every dish crafted to match a specific rare and very special wine. I would also add that I have never seen flights of wines of this quality being served in any wine dinner. So these evenings will be rare and special treats for all of us! Find Steve’s tasting notes for the wines that will be served at the Burgundy dinner here and Bordeaux dinner here. Click on the bottles below to read our tasting notes for the Burgundy and Bordeaux wines that will be available by the glass and bottle throughout October and November. Tasting note: This has a lovely clean and fresh, mineral-driven bouquet that complements the green apple and kiwi fruit aromas. It has incredible vibrancy on the palate and a wonderful line of acidity, lively citrus fruit and intense minerality on the focused finish. This is a fabulous Fourchaume which will give a great deal of pleasure. Tasting note: Yellow fruits with some toast and spice on the nose, it has great purity of fruit and is full-bodied but also quite elegant in profile for such a ripe wine, with a lovely core, underpinned by a superb line of minerality, lovely grip and a long, complex finish. This is a stunning example! Tasting note: A very layered aromatic structure comprised of pear, white stone fruit and notes of apricot. This is quite rich, oak is present but not at all intrusive with good concentration on the palate and has a wonderful mouth feel on the lengthy and vibrant finish. Tasting note: Aromas of lightly toasted almonds, floral elements and some mineral notes, It is a rich style with peach, fig and melon. The palate is also generous, toasty and creamy, very generous and with good balancing acidity, there is a long persistent finish to this lovely wine. Tasting note: Very bright citrus and floral notes with lots of minerality, the style and character of the year are in evidence in this 2010 Bourgogne Blanc. Amazing concentration and fruit quality with balancing acidity, it is beautifully refined and extremely pleasing from the ‘King’ of Meursault! Tasting note: Vibrant, fresh plum colour with good density, this has a harmonious, fresh aroma with great fruit purity. There is a wonderful lick of sweet bramble and cherry fruit across the palate covered by a muscular structure, then a gentler, graceful and very long finish. Tasting note: Beautiful vibrant colour, very gentle nose showing dark cherry, violets and some spice. On the palate this displays mostly dark berry and dark cherry fruit with a hint of liquorice and has full bodied intensity. The finish is very long and balanced, truly an iron fist in a velvet glove! Tasting note: This wine has a dark, bright core and a seductive, perfumed nose. Juicy dark cherry, redcurrants and raspberry. In the mouth it has a core red berry fruit supported by refreshing acidity. This has wonderful purity of fruit and balance, a very attractive and beautifully defined example from one of Burgundy’s top producers. Tasting note: This has a a very bright, intense yellow colour. Aromas are alluring and precise, with a mix of citrus orange with peach and grapefruit peel combined with a herbaceous element and stony minerality. The palate is complete and with great clarity and tension. Very fine. Tasting note: Intense aromas of bramble and plummy fruit with floral and mineral notes. On the palate it is dense, fleshy with an amazing purity of ripe mouth-filling fruit. It is medium to full-bodied and a great example from Christiane and Stéphane Derenoncourt. Tasting note: Château Margaux follows the practise of all the great growths in rigorously selecting the grapes that go into the ‘grand vin’ with the best remaining going into the creation of the ‘super-second’ Pavillon Rouge. In exceptional years when the quality of the grapes is very high, a third wine may be made, Margaux du Château Margaux, a wine that offers more immediate charm and pleasure. Like the best wines of the vintage, this is fresh, fragrant, very soft on the palate showing cassis and a hint of cedarwood, and with no hint of aggressive tannin. Please note image is for illustration purpose only. Tasting note: Very intense dark plum fruit on the nose with earthy undertones. Lovely freshness on the palate with soft but intense ripe plum fruit and a herbaceous finish, very well integrated tannins, beautifully balanced wine. Tasting note: Delicate and complex bouquet of tobacco and cedar with dark berry fruit, in the mouth it is dense and fleshy with soft fruit combined with hints of liquorice enveloped in a solid tannic structure on the finish. Tasting note: Very fragrant notes of blackcurrant and savoury herbs combined with spice and soft tones of oak. As you would expect it is powerful and with great fruit purity, beautifully fresh which perfectly balances the fine tannins. Tasting note: Tasting note: Dark and brooding, with black fruit on the nose, herbaceous. Huge intensity and concentration on the palate, lots of dark berry and cherry character, very fresh vibrant acidity, supported by a firm structure and rock like minerality. Tasting note: Great depth of fruit on the nose, crushed blackcurrant, also cedarwood and liquorice. The palate is well balanced and full bodied, delicious purity of fruit and supple tannins supported by a little minerality with a fine lengthy finish. Super example of a First Growth from one of the very top estates in Bordeaux. Tasting note: Very light gold in colour with attractive notes of floral, honey and apricot underpinned by some vanilla. It has good intensity and a rich texture with sweet spice and a lovely lift of citrus on the finish. Tasting note: This has a deep gold colour, a medium-bodied Barsac showing ripe apricot fruit, honey and marmalade with a fine line of minerality and a clean, pure finish.